We have been established as makers and restorers of double basses for over 35 years. Malcolm's work is highly regarded both as a restorer and maker with a number of instruments currently played by both professional and amateur players. Our workshop and showroom are now situated in the picturesque village of Boxhill, Surrey, only 5 minute's drive from the M25, and 18 miles from the centre of London. 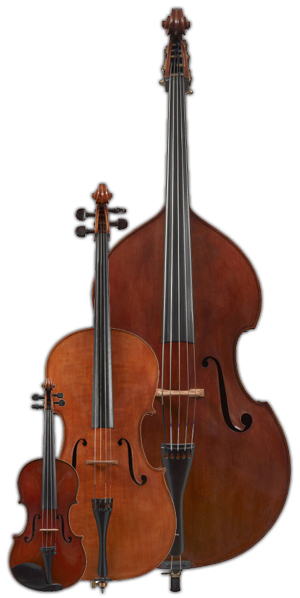 We have a large selection of double basses, cellos, violas and violins on display. We offer helpful and friendly advice built up over years of experience, and are pleased to offer a wide selection of quality violins violas cellos and double basses, at prices to suit all tastes, and levels of playing. A large selection of double bass, cello, viola and violin bows available at reasonable prices to suit all tastes, and levels of playing.